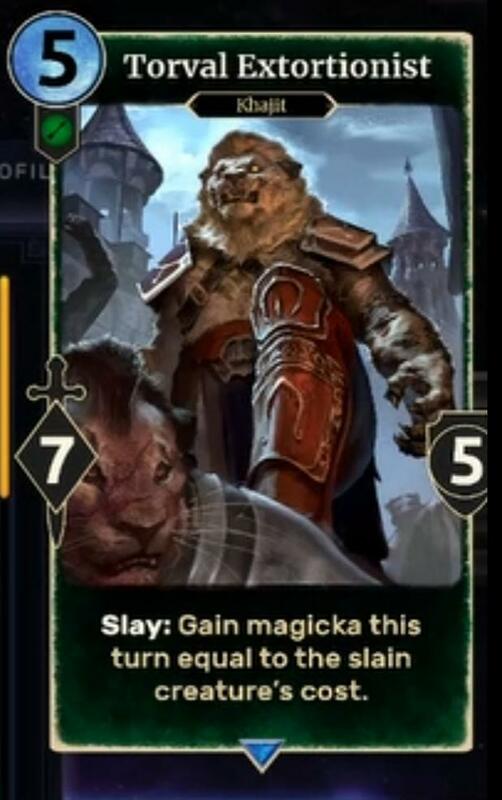 It's like the new team understands balanced cards even less than Direwolf did. Torval Extortionist is way way too good for it's cost. This card blows out of the water Pahmar-raht Renegade which is the best 5 drop beatstick at the moment. I hope this to gets nerf. 4 Health would make it at least bolt-able. Also, comparison with Cave Bear and Highland Lurcher puts into the light the power level here. New reveal: Destruction Tutor -> link. I agree with you Nicolas Lessard (Wilson) Torval Extortionist is equal in power compare to Highland Lurcher and have a good effect, need to reduce his power to 5 or increase his cost to 6 at least. His effect is applied at the hand of the opponent turn and can't be cancelled. That mean you could perform a lethal strikeback at the next turn. Need some evident balance in future because "a great power implies great responsibility". Can't see how Green Pact Ambusher is Greystone Ravager+. It has Guard, which makes it exempt from the capability of hiding in the shadow lane for a turn, a skill that Greystone Ravager has that allows it to connect to lethal many times for me. The skill to appear on a full lane is powerful, can't deny that. I think green pact ambusher will replace harpy in my prophecy battlemage. Harpy has the lowest attack in the deck (well sharpshooter but that is direct damage) and shackle doesn't seem to do much for a deck where you're happy to get attacked. Seems like an upgrade except in fringe cases. Any chance to get a free extra creature in play seems like a win for the deck.